chooky fuzzbang: vinyl: billy butler - guitar soul! vinyl: billy butler - guitar soul! As I work my way through my record collection I thought I would highlight some of the off-the-beaten-path stuff. Most of this will be jazz but there'll be some dance/electronica/trip-hop stuff too (mainly from a 30 record haul when I was visiting England). 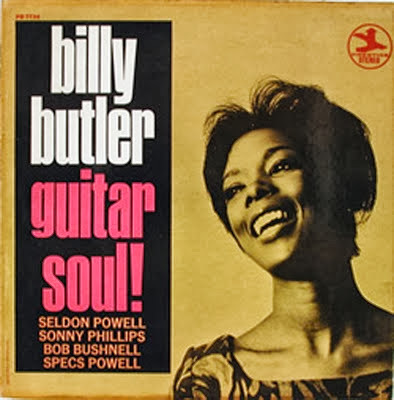 First up is Billy Butler's Guitar Soul! Technically this is a jazz album. Butler was a jazz guitarist. Not really my cup of tea generally but Butler was known as being genre-defying. He jumped all over the place with heavy doses of funk, jazz, latin, classical, and soul. He died back in 1991 and this album was made in 1969. There isn't much of a history on him. He played with some of the greats - Gillespie, Dinah Washington, Lockjaw Davis, Jimmy Smith, Benny Goodman. Finding this album is tough. It doesn't seem to be available anywhere although there are some songs on Spotify. Most of this music is the type of funky/soul you'd expect on a Tarantino movie as an instrumental backdrop to some transition scene. But it really is quite experimental and creative. Especially for its time. Pity there's no CD reissue.